I saw two shows of this tour. Berlin and Copenhagen. And it was like meeting two siblings who have the same eyes, but one is dark-haired and serious and one is blonde and funny. Copenhagen was the blonde. When I learned one thing about concerts in other countries, it is: Expect everything. So I was prepared for everything from boredom to an absolute blast. I think I got the second one though in a slightly different way from what I usually mean when I say „blast“ and „concert“ in one sentence. People in Denmark are relaxed. The DR Koncerthuset is a pretty impressing place, but going in was easy. No one was searching through my bag or touching my body from chest to shoes like I am used to in Germany. I just got in, no big deal. There was a very calm atmosphere inside. Nobody seemed to be in a rush. It helped me with my usual pre-concert nervousness and I appreciated it very much. Thank you Denmark! We got in and sat down with a little shock. We got tickets for row two but there was no row two cause the places of row two we had were basically row one. The stage was very low and it reminded me of the evening at Kampnagel when Nick Cave did the Bunny Munro Evenings together with Marty and Warren in 2009. I am used to the front row, but front seats have something about them that makes me feel uneasy. Anyway: I was placed in front of Warrens instruments. After I accepted to feel exposed like that I was quite happy about the view I would be able to get on Warren’s work. The venue is very high, with a huge organ many meters over the stage. People were seated in a circle around, many were very high up above looking down on the stage from the complete other side. It was fantastic. I loved looking up to the ceiling during the show and before. When the lights went out nobody was applauding. Relaxed Denmark again. Lovely country. I saw the band behind the curtain already and from the other side it looked funny like they were unsure if to enter the stage or not and I think I saw a little pushing around there. Once they got on stage people were getting excited of course. Nick entered the stage and looked around, he also seemed kind of fascinated by the way people were all around him. He sat down at the piano and I was thinking we get Water’s Edge like they did all other evenings so far, but as soon as I heard the flute and the loop I knew it would be a different opener – We Real Cool that was. 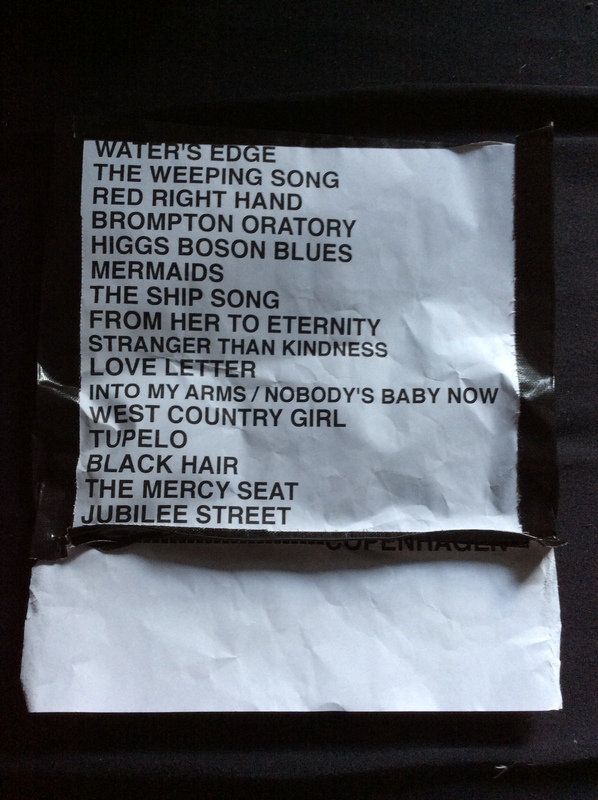 Everyone who visits shows regularly knows that is quite exciting when you sit there and something unexpected happens with the setlist – especially at a Nick Cave show. Nick stood up and walked up and down the stage. I realized I like it better when he starts the show like that and not at the piano. A start like that fits him better. Again I felt that I am not made for sitting in row one. I felt restless and strange there. During Brompton Oratory Nick Cave was begging a woman to come down to dance with him. She did it but it took a while. So he started the song alone and used the time for the I-Phone moment of the evening: A lovely woman seated next to her man who was next to me filmed at that point. Nick was suddenly coming down and in a very slow move grabbing her I-Phone and putting it into her cleavage. I think I put my hand in front of my face. It was a very strange moment. He walked away and came back singing „The smell of you still on my hands…“ while looking at her. I was somewhere inbetween amusement and discomfort in those seconds. Then the lady from up above arrived and they did a little dance like I think we have seen in Belgium already. It reminds me of a mixture of PJ Harvey and Nick Cave in Henry Lee and Bruce Springsteen’s action during Dancing In The Dark. During Higgs Boson Blues he managed that people stood up. It was my personal revelation. Finally standing. But people were sitting back down. So did I. Some stayed crouched in front of the stage. The concert took an interesting turn when he made a crowd of people sit on stage. It was like in school and reminded me of old Beat Club sessions. All these people around his feet while he was playing the piano. I got the impression there were many very young girls and that was maybe what made me think of a kind of school lession. I am unsure if I liked it when it comes to the tension of the show. I sat on the stage for a little while during Black Hair, but I hated it. Sitting there was as nervracking as sitting on my damn chair plus I thought my view was quite fucked compared to the absolutely fabulous sight I had when I just stood up, cause sitting on stage makes you unable to see the whole band. I know Nick Cave has fancy shoes, but I can’t entertain myself with them for 2.5 hours. Standing was like being front row without any other people cause they were all on stage. So I just stayed in front of the stage with a couple of others standing and therefore able see the whole band, to dance, sing and shout a lot more and have more fun. Most people seated on stage were again: Very relaxed. People drinking beer up there, cuddling couples, all that sort of stuff you would expect happening at…yeah…a folk concert? Like I said, unsure about it though the atmosphere was very comfortable. Maybe too comfortable? 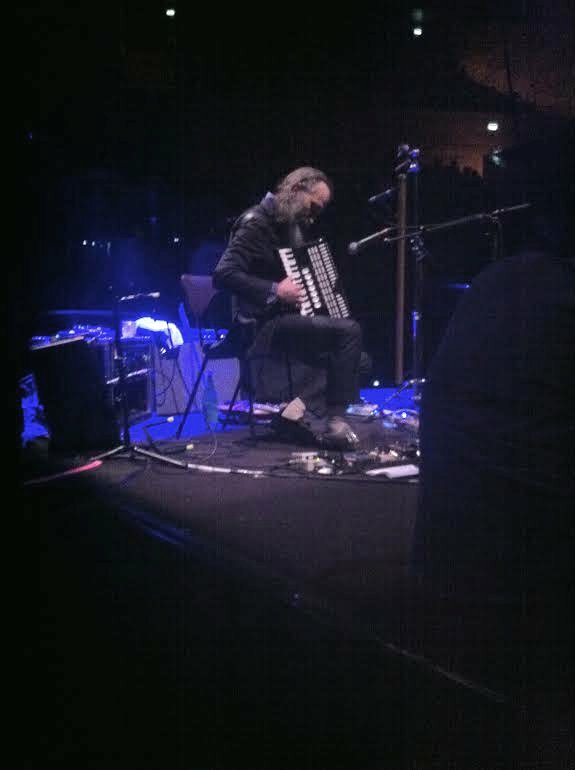 Nevertheless I loved that evening in all it’s strangeness and I was too happy about the possibility to watch Warren Ellis using his instruments. I longed for that since quite a while now, but the stage was always too high usually to see everything properly except during that evening in 2009, but he had different instruments back then of course. So it was brilliant and maybe one of the best bits of that tour for me. I think the band was in a good mood. I had a good view on Thomas and Marty as well and they seemed like they were into it and their sound was powerful. I loved that when touching that narrow stage the vibrations were running through my body in such a good way. Not like when the bass from the speakers is torturing your chest and ears but just the whole thing physically running through your veins making you feel like the music is curing all madness and pain you might have hosted inside of yourself. I think I got a lot more energy from that show than from the Berlin evening though I think Berlin was more „together“, darker and with more tension – more classic Nick Cave. But I had a bad headache that night and could not stand so much without thinking my skull will explode while in Copenhagen it was a big party during the non-ballad parts. I think I am the same broken record like Valerie, but it is true: Jack The Ripper is an oustanding performance. It blows you away and so does From Her To Eternity. Both work incredibly well in that concept and Jack The Ripper has a new style that I would love to see more of in the future. When I think Nick’s peformance lacks a bit of his usual intensity during some parts of this concept cause of all these lovely extras that nevertheless seem to partly kind of break the tension I can say: Once I see that performance of Jack The Ripper I know it does not matter so much, it is there and it will hopefully always be. Therefore I will not repeat my view about other massively played „hits“ now, cause I don’t want to put negativity into my recap of that night. I really like his lovely crowd-engaging Brompton Oratory performance. It combines a romantic tenderness with a very tongue in cheek aspect and I think I have rarely seen Nick perform like that. It is very refreshing and melts my heart. I got my first setlist in the end thanks to the nice man who told me to just wait a moment and he will bring it once we please stop crawling on stage. I never do things like that usually but I was so curious if We Real Cool was planned or spontaneous. Remembered me of the Berlinshow when many people were running on stage to grab what was not nailed on it and they had to hunt them back down.